Spring is almost here, and soon we will be celebrating Memorial Day and similar holidays, so it is the perfect time to plan your next barbecue. Nothing beats the taste of a grilled burger, hot dog, steak or chicken. Grilling is also an American tradition. Taking care of your patties with one hand while holding a beer in the other is as American as can be. And you don’t even need to be a gourmet chef; anybody can enjoy working with a grill. The debate will always go on about what is better, charcoal or gas. Charcoal is more traditional and has lots of followers. It gives your food that wonderful smoky flavor, and you always feel like a hero once you get those charcoals glowing red. So, if you’re a charcoal grilling fan, Weber’s Kettle is one of the most recognized grills. 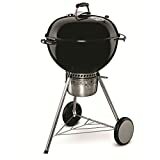 This is a modern version of Weber’s traditional design but is as trustworthy and durable as ever. One suggestion: don’t forget to get yourself a Rapidfire Chimney Starter; it will light your charcoal evenly and quickly. Cas grills are gaining popularity quickly since they are much more convenient than their charcoal versions. All it takes to light them it to twist a knob and the heat can be adjusted as you need. 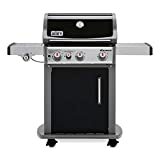 You could get top-of-the-line grills that cost almost $15,000, but this one is just as reliable, has great reviews and costs just a fraction of that price. It has a nice 424 square inch cooking area and three stainless steel burners. 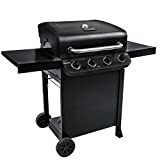 If you’re just getting started with grilling or are more on a budget, this is a grill that offers great value. Four burners, 474 inches of cooking space, plus an additional 175 inches thanks to its swing-away rack and a lid-mounted temperature gauge make this a perfect fit for your next family reunion. Don’t forget to get a Char-Broil 3-4 Burner Rip-Stop Cover. It will protect your grill against damage from the elements. But what can you do if you live in an apartment and don’t have the chance of having an outdoor grill? No worries, you could get a George Foreman GRP1060B 4 Serving Removable Plate Grill. Ask anybody who has one of these, and they’ll tell you they are just great to have. You can cook up to 4 servings on its 60 square inch cooking surface. This is more than enough to fit four one-quarter pound burger patties. For thicker food, the grill has a hinge that allows the cover to adjust. 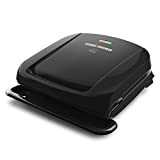 Get yourself a 3-pack George Foreman GFSP3 Sponges also, their grooved design fits perfectly into the grill.